Take your bike to alpine peaks, wonderful landscapes and pristine valleys. Ride a mix of flow, enduro and old farmers trails. This epic tour will take your breath away. Tutti Frutti Epic tour is a 45 km route which includes the new Carosello 3000 mtb trails and other historical trails of Livigno. The tour is perfect for the all-mountain, cross-country and enduro lovers. WHY SHOULD I RIDE IT? The tour has been designed to offer a mtb experience on many different trails. 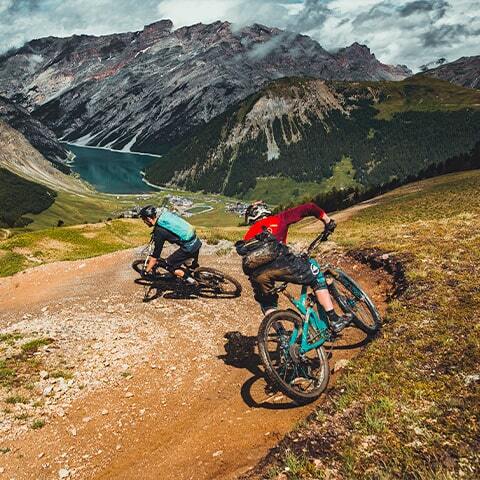 Riding Tutti Frutti Epic you’ll reach some of the most suggestive locations in Livigno and live your best bike day. Thanks to the cableways and chairlifts, the whole tour has only few hundred meters uphill riding and all the trails are of medium or easy level. Tutti Frutti Epic is suitable for all those who want to live a great adventure in mtb, according to their own level. During the summer 2018, the lifts that allow you to ride Tutti Frutti Epic will be open from Saturday, June 23rd to Sunday, September 9th . Tutti frutti Epic Mtb Tour is a big ring of mountain trails that starts and ends at the bottom station of the cableway Livigno Centro (n° 25). The tour can be made in one day and it includes some uphills with cableways and chairlifts. In order to complete it you need at least a daily Bikepass Livigno, or 1 day ticket valid for Carosello 3000 Mountain. 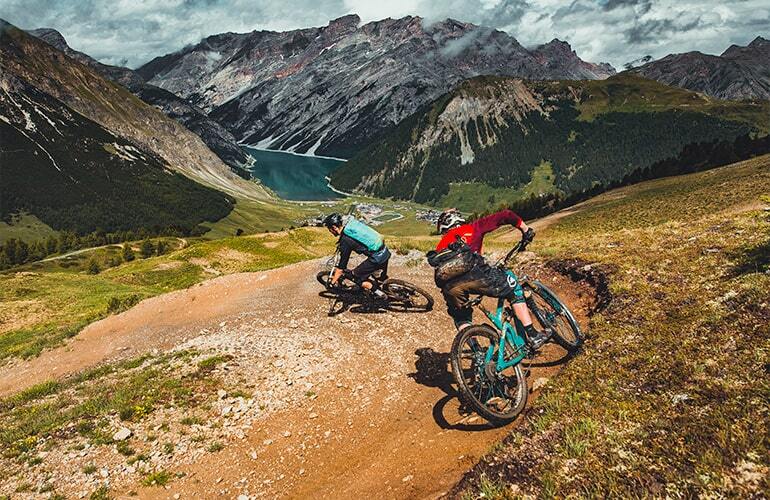 Tutti frutti Epic Mtb Tour is a ring that starts and ends at the bottom station of the cableway Livigno Centro (n° 25). The tour was devised by the pioneer of mountain biking and Livigno’s celebrity spokesperson Hans Rey. During the test ride of TuttiFrutti Epic Tour he wanted to have as a fellow rider Brian Lopes, a multiple champion of the world and (just as Hans) an inductee of the Mountain Bike Hall of Fame. Read the original story written by Hans Rey. .Flow with the contours of the trail. Ride active and absorb the rollers, jumps and berms with your arms and legs. Don’t be afraid of the berms, ride them. Every turn is slightly different, but generally speaking run the front wheel about half way up the berm. Berms are made to make you turn easier, don’t be afraid of them, when you roll them right it feels like you are on rails. Sign your name in the guest book at the Madonon hut. Experience the toilet with the worlds best view 50 meters beyond the Madonon hut. Take a selfie with a Scottish Highland Cow – if you are lucky enough to see one on the mountain. On flow-trails try to pump certain sections of trail without pedaling, see how far you can get before you have to pedal again. Pump your bike over the rollers and berms, just like on a pump track. Find and eat some blueberries on the middle part of Blueberry Line Trail (in the late summer months). At the end of the tour reward yourself with a Tutti Frutti Gelato at the Gelateria Biancaneve. Flow with the contours of the trail. Ride active and absorb the rollers, jumps and berms with your arms and legs. The TuttiFrutti Mtb Tour has been reviewed on the best mtb magazines worldwide.